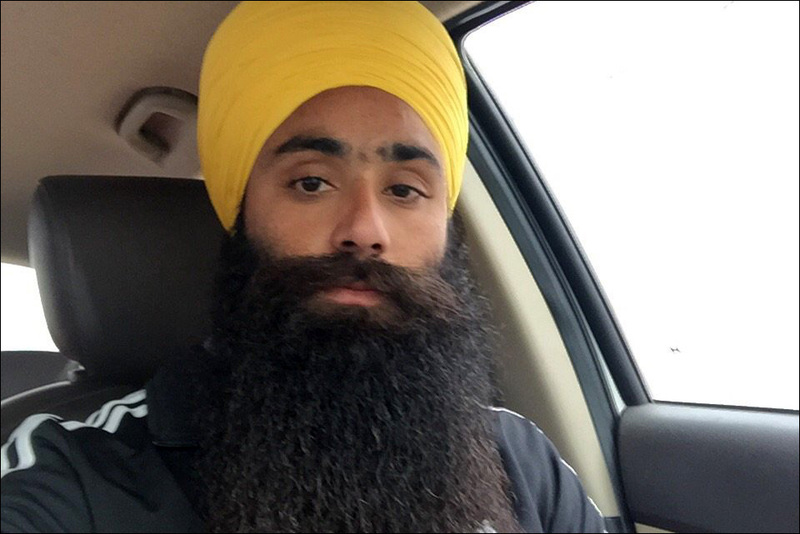 Daljeet Singh was profiled and falsely arrested while traveling aboard a Greyhound bus. 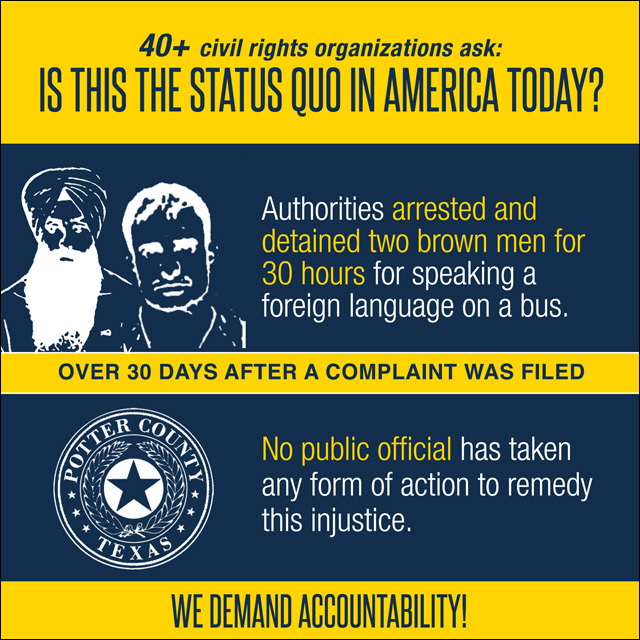 A coalition of 40 civil rights organizations are demanding accountability after two brown-skinned men were profiled, falsely arrested and mistreated by authorities in Texas while traveling aboard a Greyhound bus. In February, the two men -- Mr. Daljeet Singh and Mr. Mohammed Chotri, asylum applicants from India and Pakistan respectively -- were falsely accused of terrorism, harshly interrogated and arrested at gunpoint by authorities in Potter County, Texas. More than one month after the Sikh Coalition filed a complaint demanding an investigation into the profiling of the Sikh passenger, authorities have failed to address the case. Daljeet Singh, who wears a turban and beard in observance of his Sikh faith, was a passenger on a Greyhound bus traveling through Amarillo on February 21, 2016 when he was falsely accused by a fellow passenger of making a terroristic threat. "I was arrested at gunpoint and wrongfully detained for nearly 30 hours without question, but nobody seems to care that this was the wrong thing to do," said Mr. Singh. "My hope is that something like this never happens to another innocent person." During the bus trip from Phoenix to Indianapolis, Mr. Singh met another Punjabi-speaking man, Mohammad Chotri from Pakistan, who invited Singh to sit with him. The two men were strangers and had never met before, but shared a dialect of Punjabi. Neither man could speak or understand English fluently. Shortly after departing from Amarillo, the bus stopped on the side of the road. According to Mr. Singh, two passengers restrained him and prevented him moving or using his phone to call an English-speaking family remember. When authorities arrived, Mr. Singh was arrested, searched, made to remove his religious turban, handcuffed and detained. Later, Mr. Singh found out that another passenger had complained to the bus driver and to the police that he and Mr. Chotri had made a terroristic threat and that they were "acting suspicious." On Wednesday, a coalition of 40 local and national organizations sent a letter to the Potter County Sheriff's Office and the Potter County Attorney's Office. The letter requests a copy of the county's law enforcement profiling guidelines, new diversity training for law enforcement officers, robust translation services to protect the rights of non-English speakers, and a copy of the county's redress procedures to ensure that allegations of discriminatory treatment are fully investigated and remedied. The undersigned groups write to express our deep concern regarding a recent incident involving two asylum seekers from India and Pakistan, who were detained and arrested on a Greyhound bus on false charges of making terrorist threats. Mr. Daljeet Singh and Mr.Mohammed Chotri were arrested in large part because they spoke a language other than English. On February 21, 2016, the two men were traveling aboard a Greyhound bus in Amarillo, Texas, when they were falsely accused of making a bomb threat and detained on the bus. Mr. Chotri and Mr. Singh were then arrested at gun point, forced to s i t in a patrol car for three hours, and spen d 30 hours in a cold jail cell without blankets . Neither man committed a crime of any kind. Moreover, fellow bus passengers unlawfu lly restrained Mr. Singh and prevented him from calling his English - speaking family members , who might have been able to clarify the situation . Law enforcement officials also failed to provide Punjabi language translators to both men before arresting them, removing Mr. Singh's Sikh religious headwear in public, and transporting them to a detention center. Mr. Singh's turban was removed in violation of his religious rights and not returned to him until the next evening after he was released from detention . M ug shots of him without his turban were taken and widely distributed to the local media, causing him shame and grief. For a Sikh, the forced removal of a turban is akin to a strip search. To add insult to injury, Mr. Singh was even accused by a deputy of pretending to not know how to speak English, when in fact he is f rom India and recently applied for asylum in the United States. Arrested Sunday afternoon, the two men were released Monday evening after being cleared of all wrongdoing by federal and local authorities. Neither the passenger who filed the false police report, nor the two who restrained Mr. Chotri and Mr. Singh on the bus , were reprimanded in any way. Mr. Singh believes that he and Mr. Chotri were profiled because of their skin color and lang uage abilities, and in the case of Mr. Singh, also because of his turban. The undersigned groups believe strongly that no one should be subject to discriminatory treatment and policing on the basis of their religion, ethnicity, or English language skills. This humiliating and offensive encounter could have been avoided if the officers were properly trained in diversity and nondiscrimination; had summoned an interpreter to the scene immediately so that the two Punjabi speakers could explain themselves; or m ore thoroughly investigated the basis for the terrorism allegation, including rigorously questioning the passenger who filed the false police report. All of us have the right to live in America free from profiling and law enforcement abuse. We would thus like to work with your office to ensure that your training procedures and response protocols are responsive to the rights of these minority communities. Profiling. Profiling and discrimination implicates profound constitutional rights, including free religious expression and equal protection under the law. We would like to review any anti-profiling guidance that you provide to officers to ensure that similar incidents do not happen again. Training. We request the County to require all law enforcement officers to undergo diversity training, including for the rights of those -- such as Sikhs -- with religious headwear or attire. If such training is already in place, we would like to review it to ensure that it adequately protects these communities. Translation Services. We request the County to ensure that immediate and adequate interpretation and translation services are provided to non-English speakers accused of criminal activity or terrorism. If such services are already in place, we would like to review all applicable policies to ensure that they adequately protect the rights of non-English speakers. Redress. Investigating and responding to allegations of discrimination is just as important as prohibiting it. We would like to review your redress procedures to ensure that all allegations of discriminatory treatment are fully investigated and remedied. The undersigned groups look forward to hearing from you. Should you have any questions about this matter, please contact Arjun Singh at arjun @sikhcoalition.org.